Each day, I start class with a math routine. Whether it is a Number Talk string, If I Know Then I Know, Closest Estimate or Quick Image, those first 10-15 minutes are always my favorite math conversations of the day! Today I added Fawn’s (@fawnnguyen) Visual Patterns into the mix. 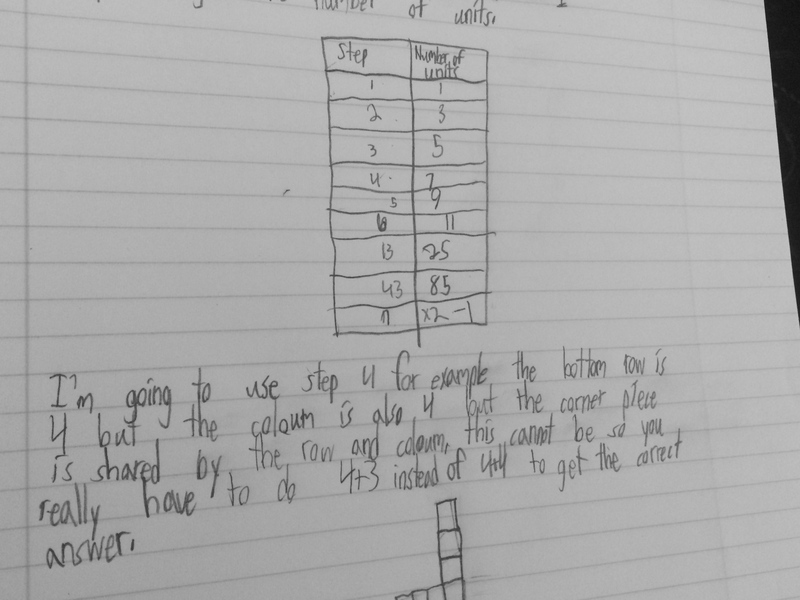 I spend a lot of class time having students look for patterns and regularity in their math work, but this visual brought a wonderfully different “feel” to their work. As Fawn had previously blogged, the Visual Patterns have an entry level for everyone and every student in my classroom engaged immediately with the images. 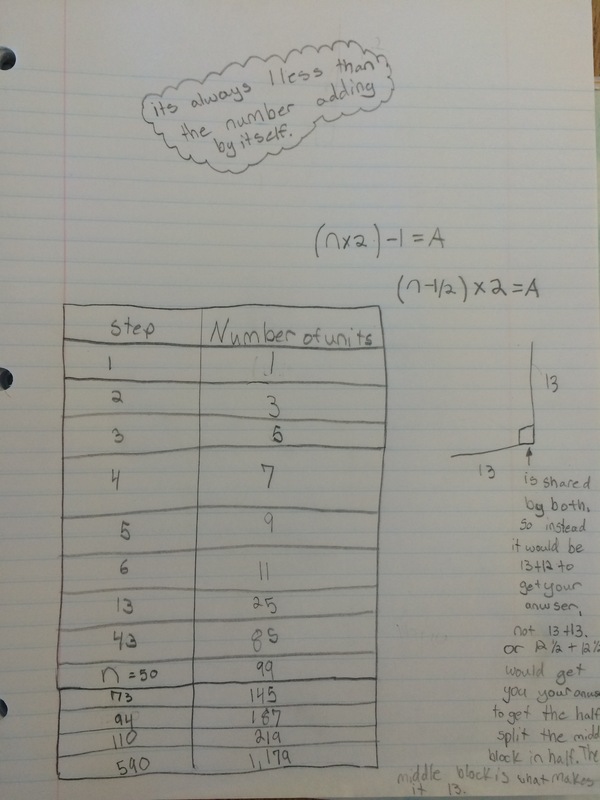 I asked the students to work as a group to find the number of unit for Steps 1 – 6, 13, 43, and then n. Being their first time, we had to deal with what the “n” meant and after the initial “Is this algebra?” followed by numerous stories of siblings who are doing this math with letters, they were on their way. It was interesting to see some students go straight to drawing each image, others started looking for what was changing as the steps progressed, and then there were the students who love going straight for an expression for finding 13 and 43. After they all had the table completed, we came together to fill it in. I was so impressed with their work and their ability to find the expression for the nth shape, however the BEST part of the conversation was taking that expression and connecting it back to the images. Why was n doubling? Why is that 1 being subtracted? This student found the equation and decided to use “a” to stand for “answer.” I loved how she then tested it with other numbers. These two students then put a different spin our our work. 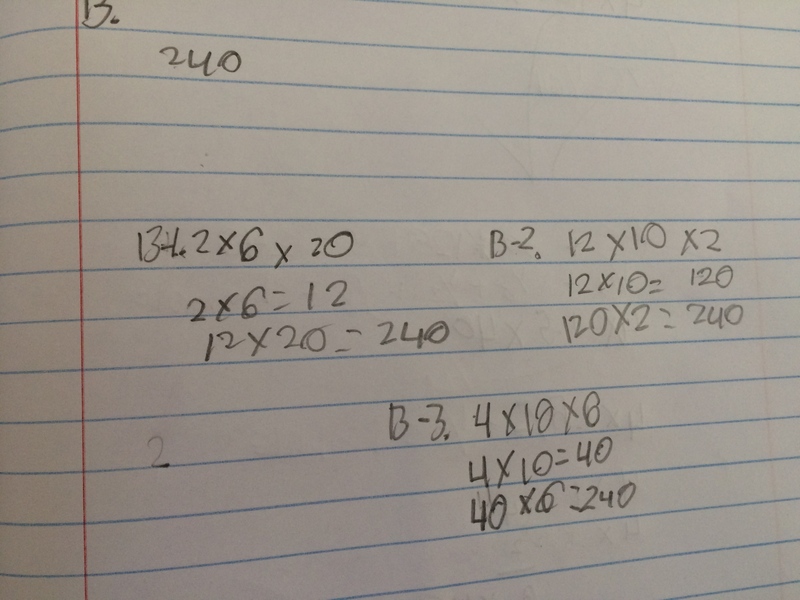 Every group in the room came to the expression n x 2 -1, and as one student was explaining how the 1 needed to be subtracted because it was being double counted, another student exclaimed that his group figured out that if you just split that block in half and made each said a mixed number you just had to multiply that by 2. 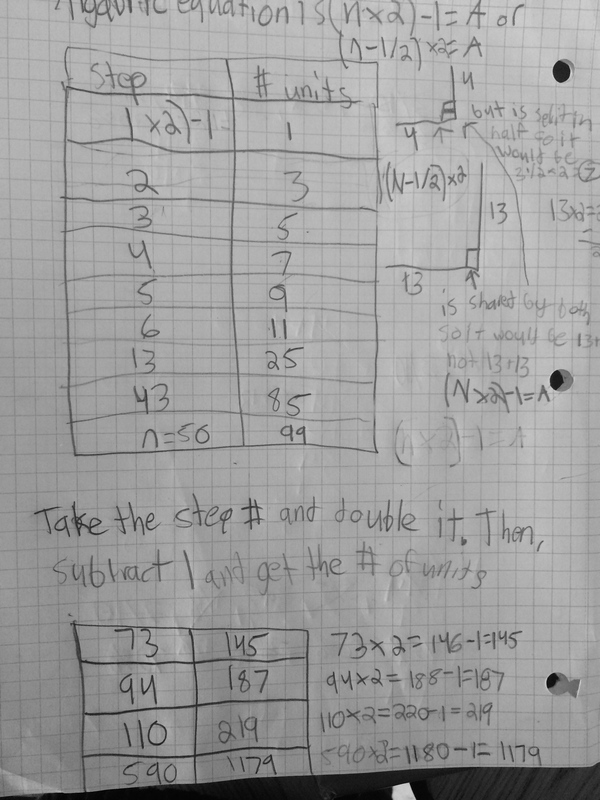 For example on step 4, if you made each side 3 1/2 x 2, you would arrive at the same answer. How awesome! I am excited to make this a part of my daily math routines, thanks Fawn for sharing, awesome stuff! I had students asking for another one before they left class that day, they loved it! 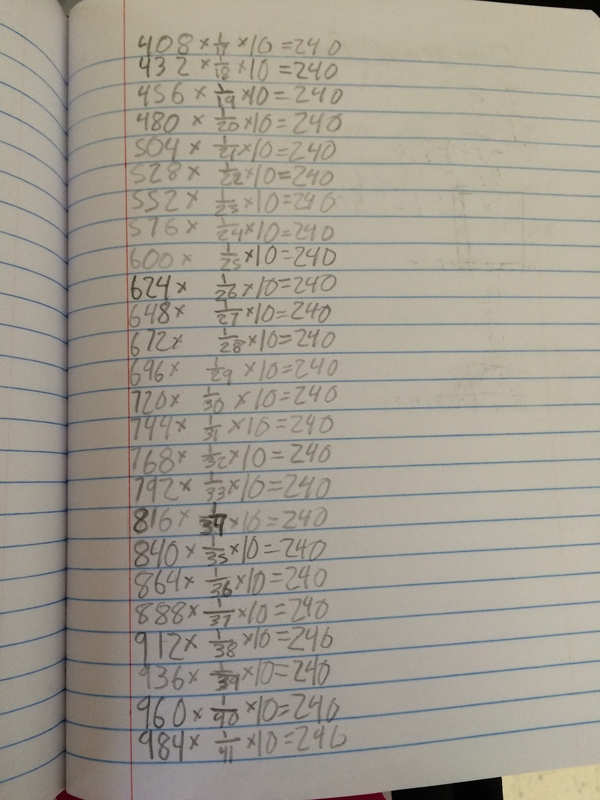 This entry was posted in 5th Grade, Math, Mathematical Practices, Uncategorized and tagged Visual Patterns on January 27, 2015 by mathmindsblog. So, what did I learn from this work? 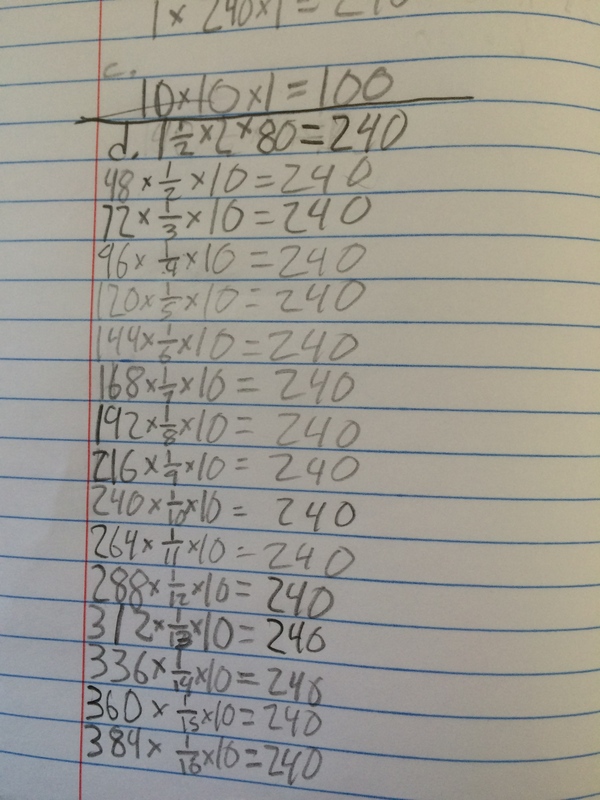 I saw they had some great understandings about taking a fraction of one factor to make a number that they knew they needed to multiply by a third whole number factor to get 240. In the first two pictures, there is a great pattern happening that I want to explore further with the whole class. 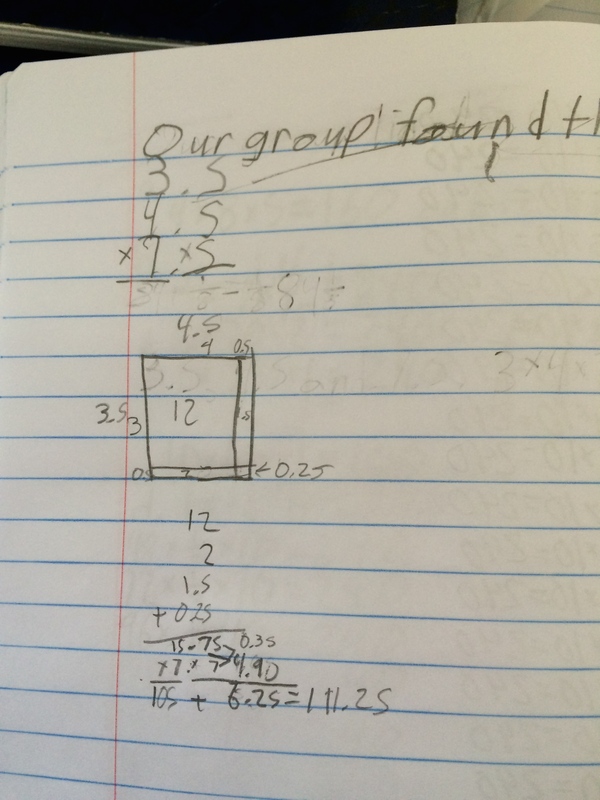 I also loved seeing that a student took the question “fractional length sides” to include decimals in his work. 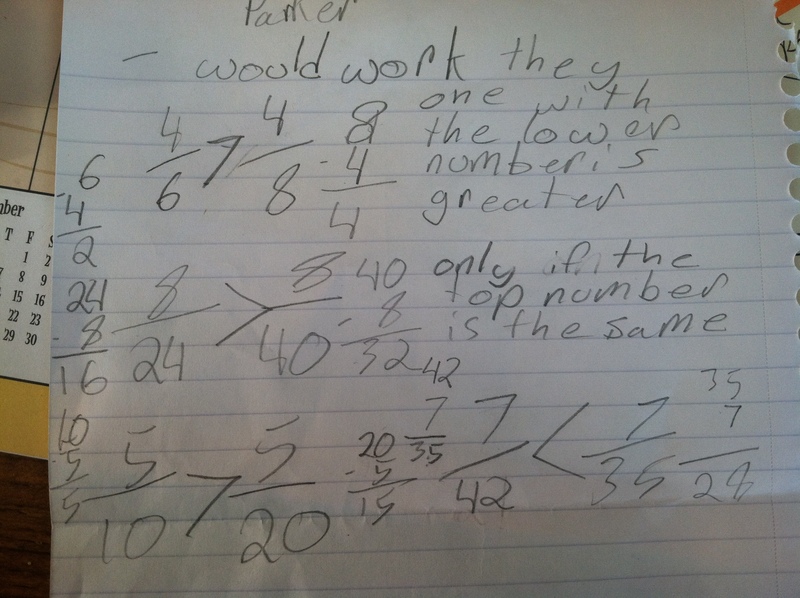 In my question, however, I had wanted them to consider more than one side in fractional lengths, however not being more explicit, they took it and ran with one side being fractional. 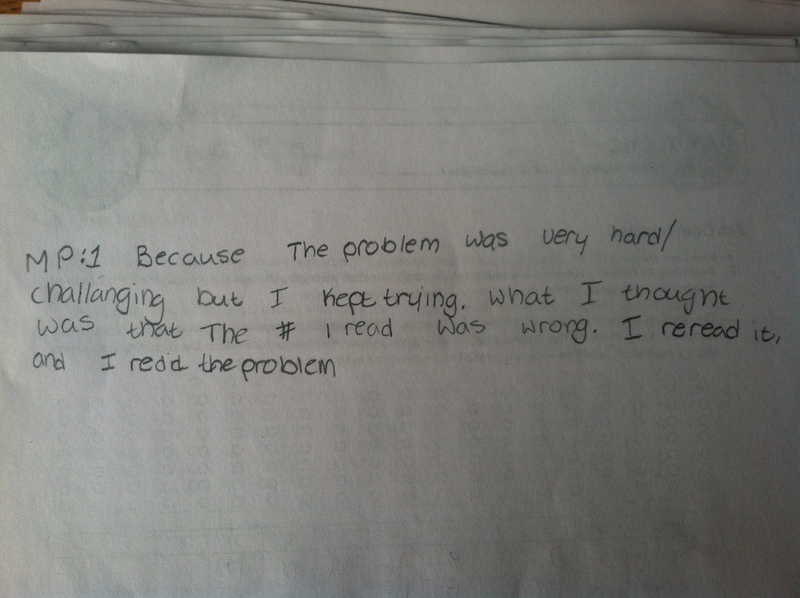 In the next lesson, I thought I would push them a bit with this. Sooo much great stuff here! I had a group who was using the cubes, coming out with halves, but not wanting to round because it was “right in the middle” of the cube. I let them go and came back to see they were multiplying whole numbers, multiplying the fractions, and then adding them together to get their product. I asked them to think about another multiplication strategy to see if they got the same product, then came the array. Another student in the same group solved mentally to get the products. Unfortunately, the class had to leave me to go to their next class, also leaving me with so many things to think about. 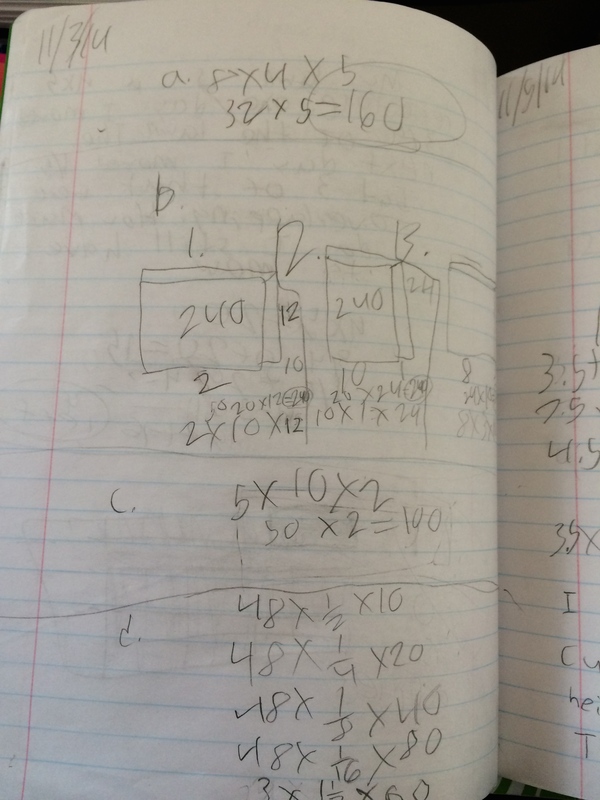 From here, I want to be sure students start to think about reasonableness of their solutions, compare their fraction multiplication strategy to whole number multiplication strategies, and think about how we multiply three numbers (Associative property). So much to do, I need full day math classes! 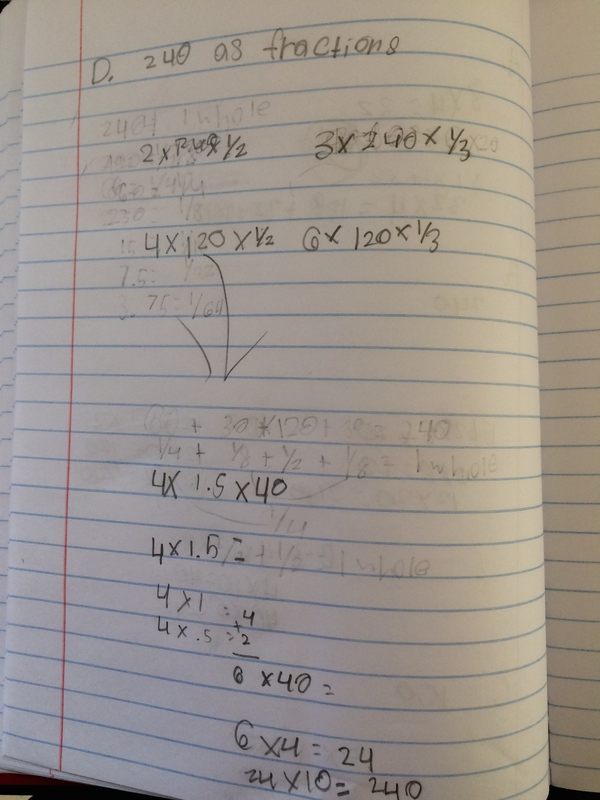 This entry was posted in 5th Grade, Decimals, Fractions, Geometry, Mathematical Practices and tagged 5th Grade, Fraction Multiplication, Volume on November 8, 2014 by mathmindsblog. Being a 5th grade class, I knew we wouldn’t get into the exponential representation, but I wanted the students to reason about what was happening each week and look for patterns in the problem. They did not disappoint. The students were very quick to jump right in…monsters, blood, vampire teeth…they were all in! 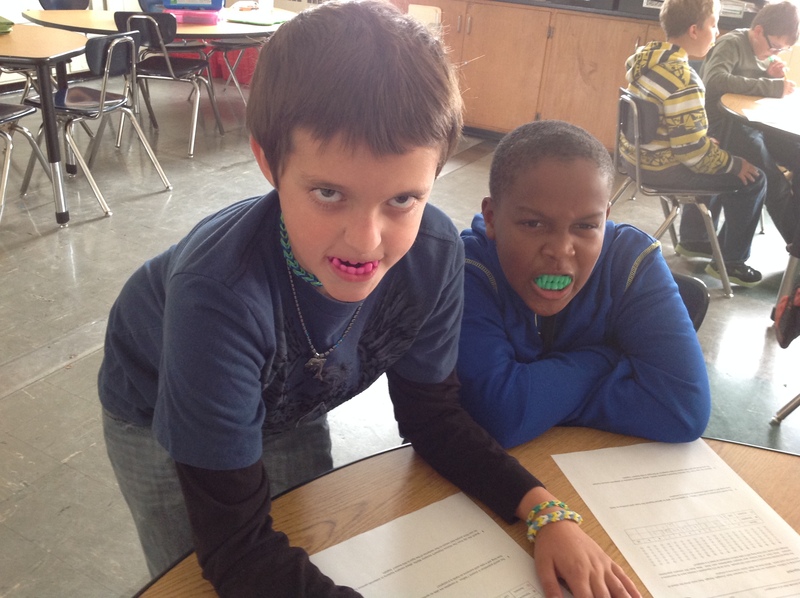 The majority of the class were fairly quick at recognizing the number of vampires was multiplying by two each week. I found the biggest struggle for them was to keep the total population in mind. For example, in Week 1 when there were 2 vampires, there had to be 138 humans because there always had to be a population of 140. The following week when there were 4 vampires, the students subtracted 4 from the Week 1 human population, arriving at 134 humans, but the total population would only be 138. It was hard for them to realize they only needed to subtract the “new vampires” from the human population, not the current vampire population. It was a struggle and some got frustrated when I would ask them if people left the town? Did you lose dots from your array? They wanted the answer, it drove them crazy and I loved it! At the end of the lesson, I had two groups who had gotten through the world population piece (they were very surprised that it didn’t take them that long to get to 7 billion)! They predicted it was going to take them forever! Math Practice 1 was by far the unanimous choice because they felt the struggle of working through a math problem. I loved reading their reflections, and it made me realize that I need to really work on asking that question more often and push them to look at the other Practices in their work. 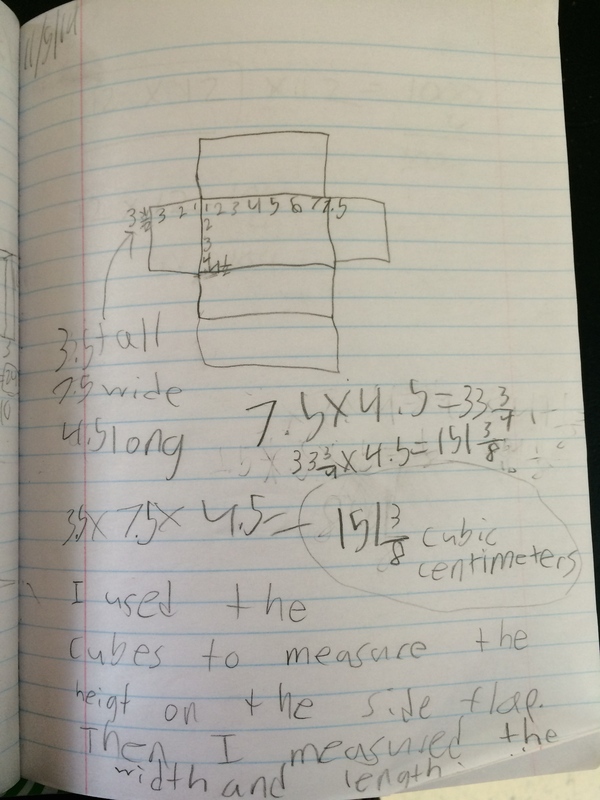 This entry was posted in Math, Mathematical Practices, Uncategorized and tagged 5th Grade, CCSS, Math, Math Practices, Mathalicious on November 3, 2013 by mathmindsblog. It has been forever since I have blogged, and although I have been so inspired from many things I read this summer, nothing inspires me like talking to my 5th graders! 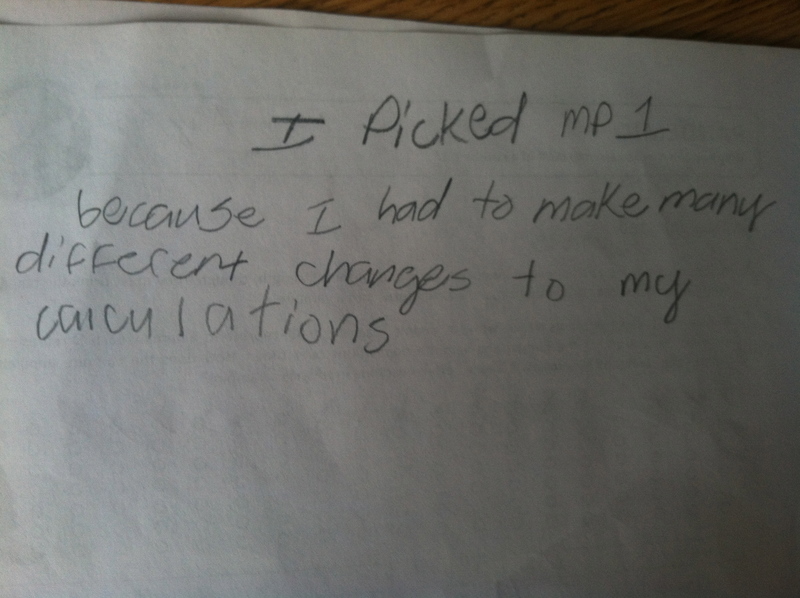 As we begin our venture into fractions, I have to first give some props to my 4th grade teachers. I have never heard so many “Yeah, fractions” and “I love fractions!” ever. I attribute this to a lot of hard work and dedication by Nancy (math specialist), the fourth grade teachers, and the Marilyn Burns’ Do the Math fraction units. 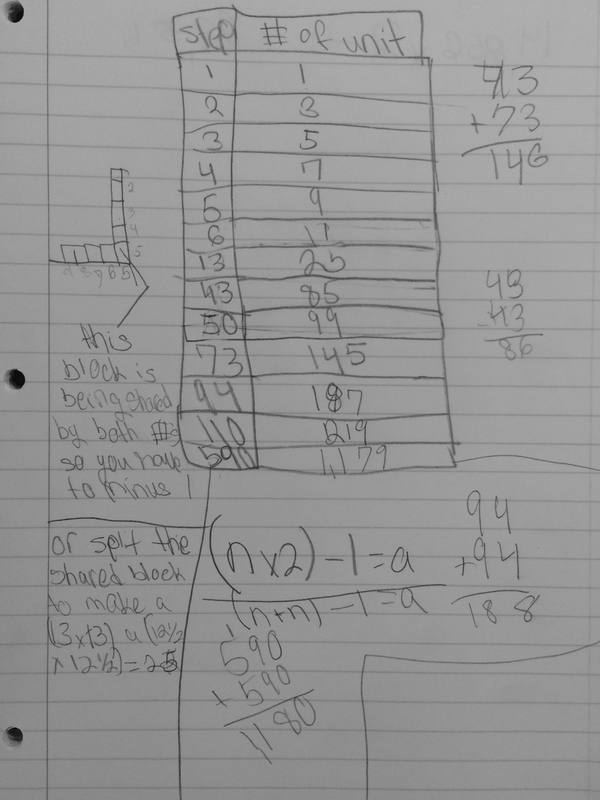 Yesterday in class, to get a feel for what my students know about fractions, we did a “Show What You Know” with problems involving writing, comparing, and adding fractions. They seemed very comfortable with writing fractions, comparing fractions using benchmarks, and finding fraction of a group. 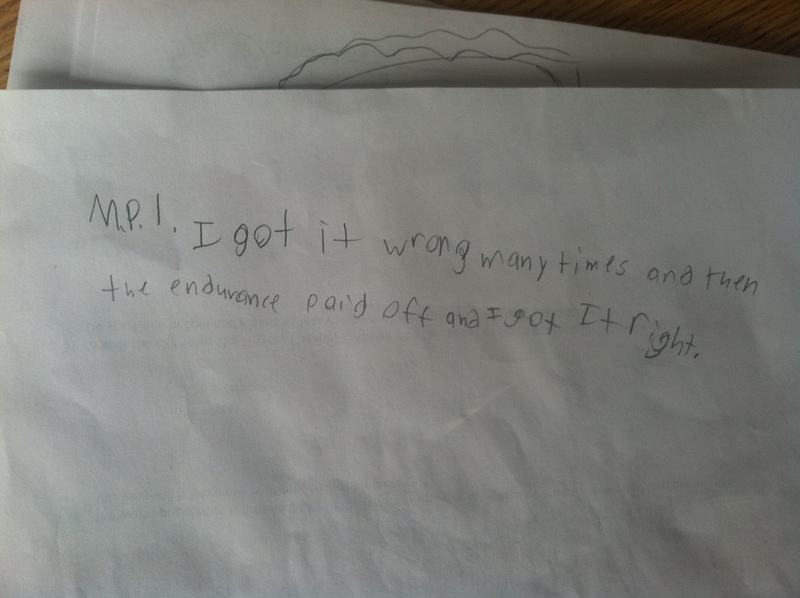 I was proud she gave examples and tested even and odd numbers to be sure that didn’t effect the outcome. – When you subtract the numerator from denominator you could finding the fractional piece the fraction is from a whole, assuming you put it back over the denominator. – But since the denominators are different this would not give you a piece of information that would make this “trick” valuable. – As the denominator gets larger and the numerator stays the same the fraction gets smaller. – So the bigger the difference between the numerator and denominator, the smaller the fraction. 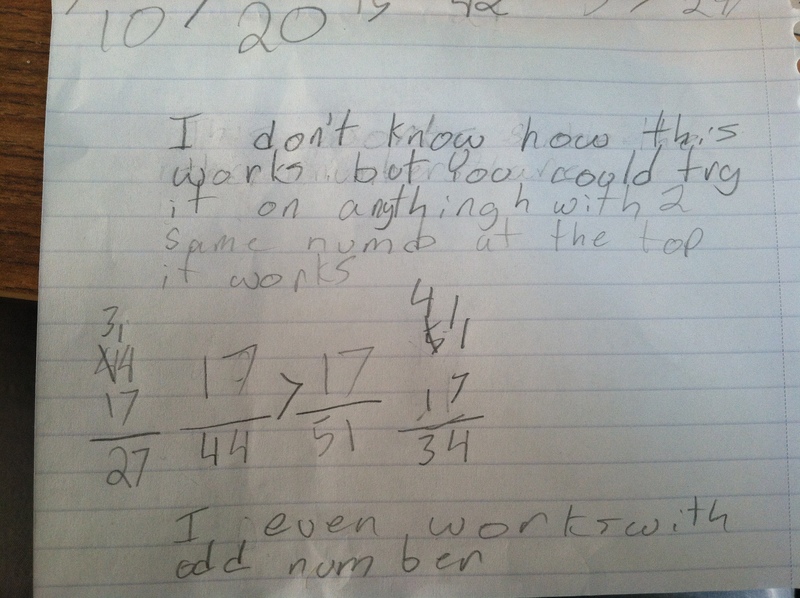 – Does it work with improper fractions? Yes. – Is it worth revisiting in class yet because some students may pick up the “trick” and not be ready for the reasoning behind why it works. – But isn’t it really simple? 3/4, 3/5, 3/6, 3/7…and so on…the difference of the numerator and denominator is getting greater, so the fraction is getting smaller. So in closing I have no answer of what to do with this information. 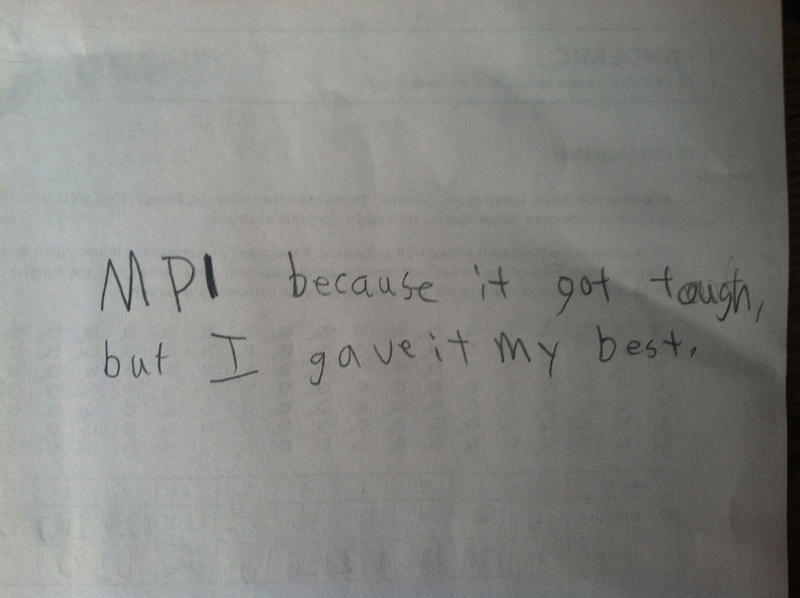 I am thinking I will revisit it with the student alone because she is anxious for why this works. I may save it for the rest until I have a better grasp on where they are with their understanding of numerator/denominator relationships, but am I being too cautious? I just don’t want “tricks” to be used because they are easier for some students than the reasoning piece. 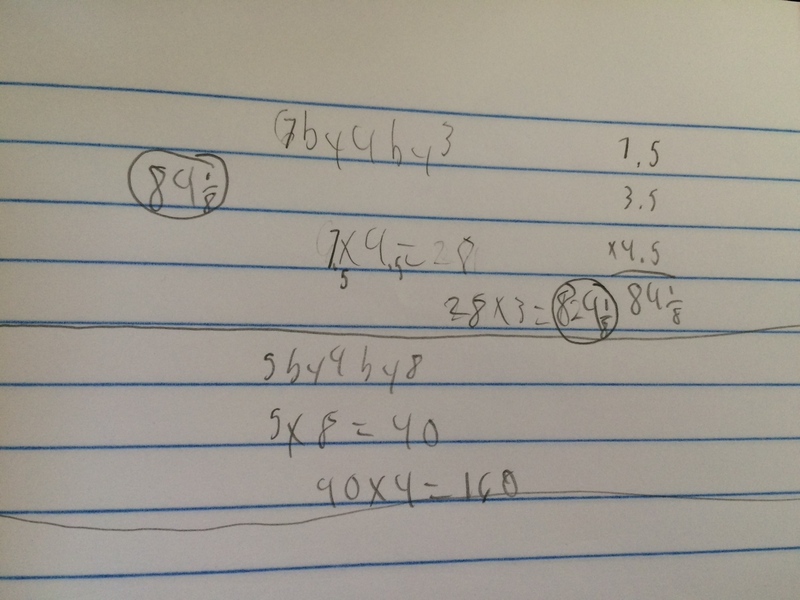 This entry was posted in Fractions, Math, Mathematical Practices, Uncategorized and tagged 5th Grade, Comparisons, Fraction, Math, numerator and denominator on October 2, 2013 by mathmindsblog.